Last week I was participating in a Twitter chat (#veganhour) and the lively conversations led us to discuss a very interesting topic: the uses of cinnamon sticks. 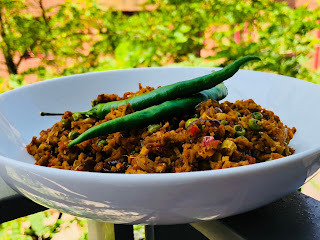 This came off one of my previous posts The 5 Whole Spices for Indian Cooking Beginners where I had confided that cinnamon sticks were my favourite spice. It seemed that while ground cinnamon is popular, few cooking enthusiasts were using cinnamon sticks. This is what prompted me to do this blog post. Here are six great reasons why I keep cinnamon sticks handy in my spice rack, and why you should too! With autumn setting in, now is the perfect time to consider stocking up and using this sweet-smelling spice. Boil a cup of water with a cinnamon stick in it. Add tea leaves or a tea bag and allow it to brew. You can add milk if you like. Enjoy a perfect cup of cinnamon brew. 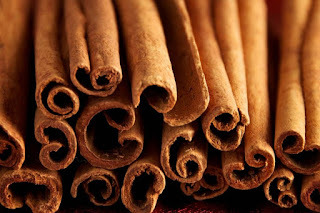 Heat a bottle of red wine with cinnamon sticks, bayleaf, sugar, ground ginger and a few slices of orange. Allow to simmer gently for 10-15 minutes. Serve in wine glasses and enjoy on a chilly night. Boil one cup basmati rice in 2 cups water. Add 1 stick of cinnamon, ½ a cup of peas and ¼ tsp salt. Allow to cook on medium heat till the rice is done. Serve with your favourite curry. Heat a cup of milk with half a cinnamon stick and a pinch of turmeric. Allow the subtle flavours to get absorbed in the milk for atleast 5-6 minutes. Add a teaspoon of honey or enjoy it plain. The aroma and sweetness of cinnamon lends a wonderful flavour to the milk. Kids will love this too and is particularly healthy. Remove the stick before serving. Boil water, sugar, and a couple of cinnamon sticks on medium heat. Whisk well till the sugar is dissolved. Pour into a jar, cool, and keep handy. Cinnamon syrup can be poured over pancakes, baked apples, cake etc whenever required. Tie a rubber band/elastic around the waist of your candle. Not place your cinnamon sticks all around the candle. The elastic will hold all the sticks in place. When the vanilla candle is lit, it will slowly warm up the cinnamon sticks and fill your room with the sweet scent of vanilla and spices. Ah….just writing this is prompting me to go and make some cinnamon tea for myself. I hope this is useful for all those planning to enjoy this ever-popular spice. Just make sure to buy actual cinnamon sticks and not cassia. Waitrose, East End, Schwartz, Bart and The Vital Ingredient are some brands in UK selling cinnamon sticks. These are easily available at Ocado, Waitrose, Holland and Barrett and at many local grocery stores.